Henry reflects on the events surrounding his enlistment in the army. Tales of imminent battle breeds panic in Henry's mind. Henry perceives his comrades to all be fearless and is fearful that he is a coward at heart. Henry reflects on his life back at his mother's farm. A conversation with a fellow soldier only amplifies Henry's anxiety. The regiment continues moving towards imminent battle. Henry comes across the body of a dead soldier. Wilson, expecting to die in battle, gives Henry a package to take to his family. Henry's brigade watches a battle in the distance. Rumors circulate throughout the men concerning the strength of the enemy and the fighting ability of certain regiments. Henry's lieutenant is wounded. Men continue to retreat from an enemy that is yet to be seen. The enemy charges Henry's regiment. Henry feels confident in his performance as the enemy retreats. The regiment celebrates their first victory. As the enemy regroups and attacks a second time, Henry is overcome with fear. Henry retreats from the front line. Henry rationalizes his fear as he continues to run from the battle. Henry finds the dead body of another soldier as he moves through the forest. The continuing sounds of the battle prompt henry to return to the front line. On the way back to his regiment, Henry is confronted by a wounded soldier. After being questioned about his wounds, Henry hurries back to the front line shamefully. Henry returns to his regiment fearing they know he retreated. Henry sees a dying soldier in the distance. The soldier is Jim Conklin. Henry is questioned about the nature of his wound as he walks with an injured soldier. Henry quickly departs the disoriented man's company as he continues to regret his cowardice. Henry comes across two groups of soldiers. 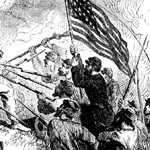 One group is retreating, while the other moves towards the battle enthusiastically. Henry joins the advancing troops, but still fears his comrades will question his momentary absence from the battle. The advancing soldiers are suddenly in retreat. Henry attempt to forcefully question a soldier only to be met with a blow to the head. A disoriented Henry is taken to his regiment by a helpful soldier. Henry is stopped by Wilson as he heads towards his regiments campfire. Henry tells Wilson he was shot in the head. Wilson dresses Henry's wound. Henry is awakened by the sounds of war. Disoriented, Henry believes the bodies of his fellow soldiers to be corpses. Henry is impressed Wilson's selflessness and self-sacrifice. As Henry marches with Wilson he remembers the letters Wilson gave him before the first battle. Henry uses the letters to rationalize his retreat. Henry returns the letters to Wilson. Henry's regiment moves to relieve a embattled unit. Henry and the men openly criticize the leadership of the brigade. Henry continues to reflect the previous days events. Henry and the other men await the enemies charge. Henry impresses his fellow soldiers while engaging the enemy in battle. Henry rest briefly, knowing that the current victory will be short lived. Henry and Wilson hear another is planning another charge. Henry's regiment has been chose for an offensive charge. Henry and Wilson inform the lieutenant of the offensive. The soldiers await the order for the charge anxiously. The men charge the enemy quickly, but eventually lose steam. The lieutenant continues to drive the men to fight on. Henry, Wilson, and the lieutenant lead the rest of the regiment toward the enemy position. Henry carries the regiment colors after the color sergeant is mortally wounded. The charge falls apart as much of the regiment retreat. Henry assists the lieutenant in regrouping the soldiers for the offensive as the enemy starts their counter attack. Henry manages to organize the regiment around the flag. The regiment repels the enemy assault. The men's confidence is restored. Henry's regiment receives little or no praise for their efforts in repelling the enemy. Henry and Wilson defend the regiment's actions. Henry and Wilson are recognized for their gallantry in the battle. The enemy makes another charge. As the battle continues, Henry observes that his fellow soldiers are losing their will to fight. The officers initiate another offensive on the enemy position, resulting in the capture of the enemy flag and the taking of four prisoners. Henry, realizing that the battle has ended for the time being, reflects on the days experiences and feels proud of his actions. Crane, Stephen. The Red Badge of Courage. Lit2Go Edition. 1895. Web. <https://etc.usf.edu/lit2go/176/the-red-badge-of-courage/>. April 26, 2019. Stephen Crane, The Red Badge of Courage, Li2Go edition, (1895), accessed April 26, 2019, https://etc.usf.edu/lit2go/176/the-red-badge-of-courage/.